passed away on March 25, 2019 at her home. Olivia was born on May 13, 1928, in Corpus Christi, Texas to the late Martiano Garcia and Tomasita Trevino Garcia. In her early years, she was active in her children’s elementary PTA and was an avid league bowler. Olivia and Archie loved dancing and enjoyed socials with friends in dance halls all over Texas. Olivia was a longtime employee of CCISD and was affectionately known as “Libby” to her friends. In addition to her husband, she was preceded in death by her son, Rudolph Llanes, her son-in-law, Ernest Rea, Jr., and her siblings: Fernando Garcia, Raul Garcia, Guillermo Garcia, Lois Tanguma and Reynaldo Samaniego. 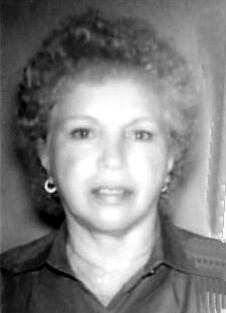 Olivia is survived by her children, Yvonne Edwards, Olivia Rea, and Frutoso (Sylvia) Llanes, Jr; grandchildren Lisa Cano, Kathy (Victoria) Lopez, Gena (Wayne) Duval, Ernest (Stephanie) Rea III, Damien Llanes, and Rudolph Llanes, numerous great-grandchildren and great- great grandchildren and her beloved dog, Parker Ray. She is also survived by her sisters Mary Flores and Diana (Val) DeLeon. staff for their great care and compassion. Christi Funeral Home with a rosary/service to be held at 10:00 a.m.
Interment to follow at Rose Hill Memorial Park.